The trash company (Republic Services) has requested to change the pick-up dates for Yard Waste. They are not changing the overall service that they provide, just the dates of pick-up. This change is to provide better service to our residents. Yard waste pick-ups will remain on Tuesday’s, but will be moved to the opposite week that it is currently being picked up. They have agreed to pick up yard waste every week until the end of January to assist in the transition. Yard Waste pickup will be on Tuesday, January 15th (new week), January 22nd (current week), January 29th (new week), February 12th (new week) and every other Tuesday for the remainder of the year. A new updated trash calendar is attached to this newsletter. The Town Hall will be closed Tuesday, January 1, 2019 and will re-open on Wednesday, January 2, 2019. Happy New Year! 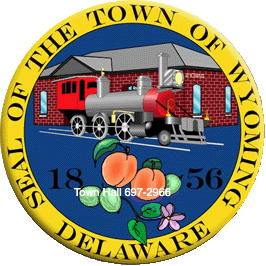 The Wyoming Town Hall will be closed Monday, December 24, 2018 and Tuesday, December 25, 2018 for the Christmas holiday. Normal business hours will resume on Wednesday, December 26, 2018. Applications are now being accepted for the Community Development Block Grant (CDBG). If you are low income and need repairs to your home that you own within town limits, please contact Town Hall at 302-697-2966.